Elves is now a pretty strong deck when it’s just plain old monogreen, and offers certain advantages in staying so (namely less damage from lands, Nykthos, Shrine to Nyx, Cavern of Souls, and Pendelhaven are more consistent, and we’re not really hurt by Blood Moon), but exploring a splash is always important to see if we can create an even better version of the deck. Blue’s main draw (pun unintentional) is counterspells, which don’t fit in a proactive mostly aggro deck like ours. Coiling Oracle would make for a nice upgrade over Elvish Visionary, Hurkyl’s Recall is great (although not a creature), Bribery and Alchemist’s Refuge are intriguing, and blue helps with Spellskite, but overall I don’t think it’s quite enough. Black offers disruption which poses a similar issue — it could be useful mainly against wrath or to slow down our opponent enough for us to win before them, but generally, I think we’d rather just race. There’s also Prowess of the Fair (note it counts as an elf for Heritage), which might be good, or just inferior to creatures. Red really just gives us Magus of the Moon, which would probably be a great idea in greedy metas that also have a lot of Amulet, but otherwise, it doesn’t offer enough. So, we’re left with white, which happens to offer a ton of things we want: hate for Burn, Affinity, Amulet, and much more. Even better, most of the cards we want are creatures (good for our Collected Company toolbox, and because we’re an aggressive deck). Let’s take a look at what white brings us. Kataki, War’s Wage: This man-creature-lady-god-whatever thing almost always annihilates Affinity, strapping their resources so hard they can do little but swing for small amount of damage and hope it’s enough. Often they won’t even be able to do that. Affinity is a hard match for us if we don’t draw hate cards, and this is the best one of all for us, made easier to find courtesy of Company and tutors. Thalia, Guardian of Thraben: What do you do when disruption is ruining your day? Disrupt the disruption, of course. This young lady can be a real nightmare for most of the top decks in the format right now by doing a lot of work against opposing disruption and Burn (which can be tough), among other things. This makes her relevant enough I have to consider maindecking her. The big problem with her is she hurts Company, which can be annoying sometimes at 4cmc, let alone 5. Given Company is the whole reason the deck is now viable, this is troublesome. Burrenton Forge-Tender: Nice for decks running Pyroclasm or Electrolyze, and can do a little work versus Burn, too. Kor Firewalker: A nasty, near unbeatable card for Burn, which can otherwise be a tough deck to beat if you’re running Elves. We do need it turn 2 for it to be good most of the time — this could prove difficult to achieve with our manabase. Those are the toolbox creatures. Now let’s take a look at a couple of non-creatures. Worship: We’ll rarely have trouble keeping this turned on, and many decks have few or no answers for it (take that, BGx!). More, since we run little or no artifacts or enchantments mainboard, our opponent is likely not going to board in any hate for it. And even when they do, we’re just going to run it as a 1-of, so we’re likely gaining more than they are from that exchange. I could see this being a monster versus most of the top decks right now. Thalia makes it maybe more expensive than it’s worth, so that’s another reason to not run her. Horizon Canopy: Mana fixing that doubles as a cantrip — yes, please. I like this card more because splashing white likely means we have to cut back on non-basics that don’t tap for two colours, but we still want some kind of land-based advantages. Gavony Township: Speaking of land-based advantages, this is a great one, furthering our backup beatdown plan. Yeah, it taps for colourless only, but squeezing in one should help a lot more than it will hurt (as is the case with Nykthos in monogreen). Whether or not to use Thalia is still a debate in my mind and is something I will likely test in the future, but for now my instinct tells me this is right. Possibly I will put her sideboard, if only for Burn. I was testing 3-4 Ooze in the monogreen build, and while it was great against all the Delver, Abzan, and other decks about, it was usually terrible versus Burn and Affinity, so I feel like 1 main, 2 side is an okay balance. It will be relevant more often against Burn and Affinity this way, and still seen fairly often in the matchups it’s great in. The landbase should maybe be tweaked to not be hurt so badly by Blood Moon. Another downside of it is our Burn matchup is now worse, and it was already less than desirable. All that said, I’m pretty happy with this list as a first iteration. 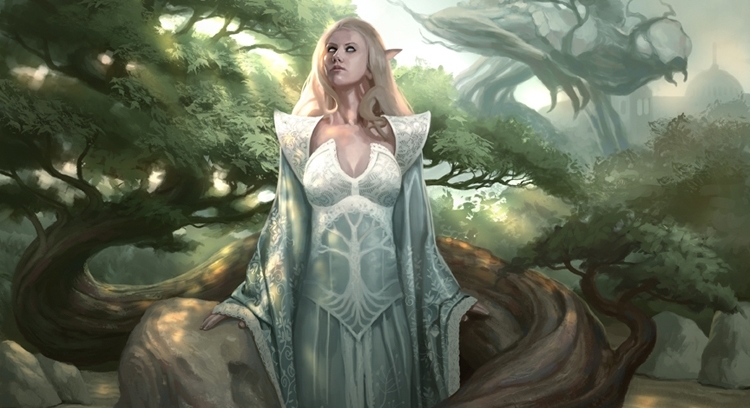 In future articles, I’ll have testing and daily footage and impressions to determine whether Elves is really better off for white or not. Until then! I’m with it, although I think a black splash could be okay as well. Abrupt decay is always great and sees play in most legacy elve’s list (they also get to play DRS of coarse making the black splash a little more useful). Golgari charm for the regeneration clause against non-wrath/damnation wipes, but not sure if it’s good enough. White splash probably makes the most sense in modern because of all the silver bullets post board. A question about the main deck, wouldn’t you want some more singleton “silver bullet” creatures main deck because of the 4 MD fauna shaman? I feel like being able to toolbox like that game 1 would be great. Being able to grab a single reclamation sage, essence warden, thalia, or whatever you need game 1. It would obviously be better in list running chord, but I still think the deck could take advantage of it. And I know that this deck is less about the “combo-y-ness” of elves and more about overwhelming the opponent and beating down, but I feel like having that many mana dorks, nykthos, and fauna shaman wants to still have access to the craterhoof, but Im probably wrong. Reactive cards like Charm aren’t what we want in a deck like this. We need to be as proactive as possible, with any reactive effects serving as a bonus (like Company). Leaving up mana feels bad if we’re not a tempo deck. Charm has other modes but they’re unreliable/not very relevant. Decay is sweet but what do we really need it for? We can go over the top of or block/regen most creatures, and we don’t care about most other permanents. I might be missing some cards but I don’t think so. Legacy is NOT Modern. Very dangerous to think what works there works here. I certainly considered maindeck silver bullets but decided against it. I think we’re best if we’re just a flat out Elves deck (with the exception of Ooze, but that has synergy with Shaman, so it gets a pass — you could make a case for Skite, too, since it protects our guys). Our silver bullets are just dead or bad against too many top decks for my liking (they’re good against a lot, too, but I don’t like being ~50/50), so I leave them to the side. That and yeah, it’s best with Chord, and Chord is bad with Company (in my experience and opinion, anyway). The hatebears/toolbox approach is better in other shells, I think, but this could just be my preferences showing. I hate the anti-synergy between Hoof and Company, and Ezuri is as good or better 90% of the time anyway. Edit: Made a bunch of tweaks to the list. Feels pretty slick now. I like the addition of spellskite main, but I still think that if I was playing this deck in an MTGO event I would run one essence warden main to tutor for G1 just because of how prevalent burn/aggressive linear strategies are online. Thats just me though. On the craterhoof thing, I ran the calcs on a hypergeometric calculator, and your chances of always hitting TWO creatures with CC drops from 99.8% of the time to 99.7%. And thats calculating for a turn 3 CC on the play, they go up if it’s cast any later in the game/ if youre on the draw. I still think that the singleton craterhoof would be worth it. You’re sure that’s right? That doesn’t seem right. What if theoretically we run 2? I found when running 2 Chord, Company was getting me 1 creature a lot more than when I was running none. Yeah I definitely considered it. Burn is extremely popular, and it’s a relevant card against some other top decks. It’s just so dead against a lot of others, too, which bothers me. But it’s a preference thing, so go for it if that’s your jam. I will say I’m not sure how effective it’d be against Burn as a 1-of, though, – I’m inclined to think not very. it’s better than nothing! I understand by turn 3 (earliest you could get it out) it’s not as relevant, but honestly if it even buys 1 extra turn that can make all the difference between winning and losing. The calcs could never be 100% correct, it depends on how many creature/non-creatures you draw by the time you cast CC. But just taking your initial ratio and running the calcs, those are the percentages you would have. So it’s safe to say they are accurate with a couple % buffer for variation. at worst were looking at 96.3% chance to hit 2 creatures with 1 craterhoof, and that’s on turn 3 on the play with 2 lands in play, 2 mana dorks, and 4 more creatures in hand with converted mana cost 3 or less(aka removing the maximum amount of targets). With two you go to at WORST 95%, and thats running the calcs for you having all creatures in hand and no lands and spells (which it would be impossible to cast CC anyways because you have no lands in play). Your math is off, or you are making a bunch of assumptions that are not helpful for actual deck building. With 38 viable hits, you have a 97.85% chance to hit 2, and moving down to 37 makes it 97.31% chance. I still agree with your conclusion about craterhoof, but your math is not correct. You are giving only the odds for a very specific draw with X lands, X creatures, and X specific ratios in hand on turn 3. Yeah I said that there were too many variables to ever really know 100%, but given his ratio its safe to say its over 90% most of the time. Good call though I dont really know how to do the math with that many variables. Are you sure you want to splurge 4 mana on Worship? I recognize the value of having more time to pull your combo off, but I feel that in most cases you only need one more turn, and in that scenario Angel’s Grace outperforms it pretty handily by being cheaper and harder to answer. 4 mana is nothing for this deck and permanent effects are more useful than one time effects for us overall (keeping in mind we no artifacts or enchantments main excepting the 1-of Skite, and only one side, so they’re either not going to side in removal for it, or they’re going to lose more than they gain by doing so). It’s not about setting up a combo (we rarely combo), it’s just about grinding out decks with a lot of speed and/or removal, and also for beating Burn. That said, I’ve never actually played with Worship before, so I’m not 100% on it. Love this site and all the analysis you do. A few notes: why no mention of Mark of Asylum? That seems like one of the bigger draws for white, allowing you to assemble everything with nigh impunity. I understand you’d need to run 2-3 to see it often, but it beats facing down an army of lightning bolt, electrolyze, snapcasters. With regards to worship, it may not be so good outside of burn. It stops damage, but not loss of life. If worship has an effect on the game, it means you got to 1 life. Junk can kill you with a siege rhino then. And if it is only for the burn matchup, I think simple life gain is better. I didn’t see Mark of Asylum when looking through white options for some reason. Definitely a solid card. I’m more interested because it protects against Pyroclasm, but it’s certainly nice against those cards, too. I’d take out Tactics, an Ooze, or Worship for it. I’m not a big fan of including multiples of cards that do nothing in multiples, plus the less non-creature spells, the better Company is, so I’d just run the one, personally. Good point about Junk, but it still works against Twin, Affinity, Delver, Jund, Bloom, Merfolk, etc. Have you thought about adding Chord of Calling to your decks? It’s great vs all decks and makes Burn a little better to combat. Chord for Burrenton against sweepers (volcanic fallout, bonfire of the damned), spot removal etc. I added them to my list and haven’t looked back. I feel personally that Devoted Druid felt more like a win more card and with it or without the deck still wants to win by the EoT turn 3 and beginning turn 4. Thanks for these lists! Elves were my favorite tribe many many years ago and it’s nice to see them make a come back! The idea is maximum synergy with Company. I used to run Chord but found it interfered with Company too much for my liking. But I may go back to a 2-2 Chord-Shaman split or use some other configuration – the advantages may well outweigh the disadvantages. Devoted Druid has been a big help for me, getting me that extra bit of mana when I need it, getting me the combo win when otherwise I wouldn’t be able to win, allowing me to be be aggressive and defensive, helping me recover better after wrath, and allowing me to pay for things while still attacking. Still, I may drop some. Since you specifically mention BGx, Siege Rhino gets around Worship.